As everyone around here is celebrating thanksgiving, it is difficult to escape the essence of it. Come to think of it there is so much for me to thank god, my family and my friends. After the little boy was born I had the urge to do something for myself than sit at home all the time. With the support of my hubby,in-laws and my parents I joined a course and started teaching. I did not feel guilty as the kiddo was in safe hands and I worked part time. The staff at school was very helpful and understanding. When I felt I could go ahead working full time and got a good opportunity I had to let it go as my hubby had an offer to work for sometime in US. It was painful for us say good bye to our family who doted on the grandchild. We were prepared that life is not going to be easy in a foreign land without our family. One of our family friend who were with us in Shanghai too reached US on the same day. I was so glad that I had a friend in this alien land. As we were in the process of searching a house, we met a friendly family and also one of my brother's friend which changed the scene altogether.We made a good group of friends and now its been 6 months we came here and I never realized how the time has passed. My hubby and friends have been with me in all the times, good and bad. The little boy is a blessing from heaven above bringing smile to our face. Dear god, Thank you for everything. Talking about food, I have loved Sabudana Khichdi ever since I tasted it first. It was back in Shanghai a dear friend of mine from Maharashtra would lovingly pack a box full of steaming hot Khichdi whenever she made it. When they moved back to India another sweet lady S moved in. She too was a Maharashtrian and made awesome Bhakri, Pithla and not to forget this divine Khichdi. Now I would get my quota of delicious food and never ever bothered making it on my own. When we moved to India, I was too busy with my pregnancy and motherhood until we came to US. Bought a packet of Sabudana and googled for the recipe. The search landed me on Aayi's recipe which is a treasure trove of Konkani recipes. One fine day I decided to make it for our friends here and was planning to use the same recipe and soaked the Sabudana. When I was about to make it my dear friend P came to rescue and she made it for all of us. The recipe was so tasty that I made a mental note of it and made it again the next time. It is very simple and tasty too. 1) Soak sabudana for 30 mins. Drain and keep it covered overnight. 2) To the soaked sabudana, add red chilli powder, peanut powder and salt. Mix well. 3) Heat ghee, add jeera. When they splutter add curry leaves and green chilli. Mix in the chopped potatoes and fry. 4) Mix in the sabudana and cook on low flame until the pearls are cooked and become slightly transparent. 5) Add in the lime juice and mix. Serve hot. I have observed that, using this method of soaking the sabudana makes it fluffy and they dont turn into gooey mess and keeps well in lunch box too. But make sure that you warm it up before eating. A post that I wanted to share during Diwali but unfortunately I could not as my little boy came down with fever and then it passed on to me and the whole weekend went by rushing one of us in turns to the doctor. 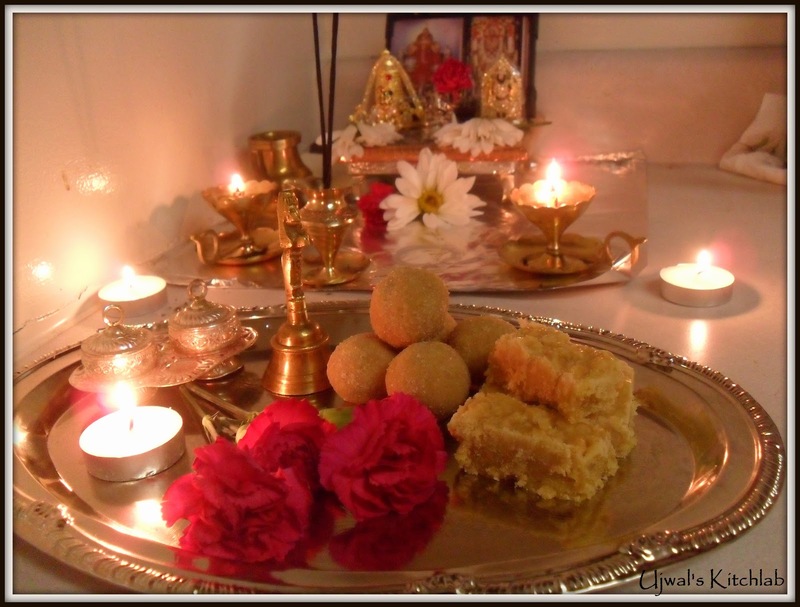 Diwali at home has always been special, be it the oil bath, mom's cooking, the oil diya's or the fire crackers. Celebrating the festival with the family makes it more special. My parents used to buy crackers much ahead of Diwali and we eagerly waited to open the packets. On the Lakshmi pooja day, I and my dad would decorate my grand mother's Lakshmi idol with flowers and gold, mom would be busy with cooking and brother would arrange the fire crackers. In the evening all our cousins would come home and after the Pooja we would enjoy the fire cracker session. After the fire crackers, everyone would join to clear the mess and then we would have a campfire. Over the years we have minimized the usage of fire crackers. But the memories of the olden days will surely warm us up. My little one will surely miss these things being far away from our home. I am sure my in-laws and parents would have loved it if he would be there during festivals. He would have so many fond memories just the way his mom does. I try to celebrate most of the festivals here in effort to make little memories for my little one. He is still young to understand though. This Diwali I made some wheat laddus aka Churmundo, Rasmalai and 7 cup Barfi. This is the first time I attempted making Barfi's at home. They are quite simple and very tasty too. 1) Grease a brownie tray or a plate to set the Barfi. 2) Heat a non stick kadhai and dry roast the flour for 2-3 minutes. Take care that colour does not change. 3) Mix all the ingredients in the kadhai and cook it on medium flame for almost 20-25 mins. Keep stirring in between to ensure that the sweet does not stick to the bottom. 4) The mixture will bubble while cooking and when it is done will start leaving the sides. Switch off the flame and transfer immediately to the greased tray. 5) Let it cool for some time. When the mixture is still warm cut into desired shapes. 6) When completely cooled transfer to an air tight container.